Summer season knocks loud at Marseille Provence's door! 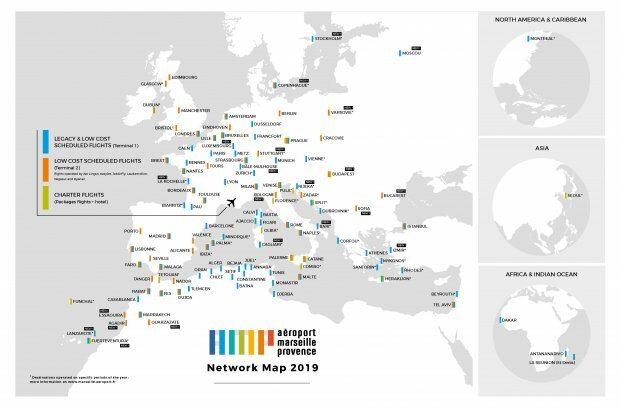 This summer, 121 destinations (+14 vs 2017) in 31 countries (+4 vs 2017) will be connected to Marseille Provence. In total, 168 routes will be flown by 36 airlines. 23 new direct routes, including 16 new destinations! Aigle Azur, 2nd biggest french carrier, will base a 2nd aircraft in MRS and launch a new route to Moscow Domodedovo. Volotea will reinforce its base in MRS with 4 new destinations: Bari, Cagliari, Rijeka, Luxembourg. 23 destinations are offered from MRs bu the spanish carrier. Ryanair will set a base in MRS as per S19 with 2 aircraft. 5 new routes launched to Alicante, Bordeaux, Manchester, Naples and Prague. 6 new destinations to Agadir, Ouarzazate, Bucharest, Budapest, Warsaw and Bologna. Ryanair again has already announced the reinforcement of its base in MRS this winter 2019, with a 3rd additional aircraft. Marseille Provence airport thanks again its airlines partners for these great developments!